The buy-back rate at the recently concluded Keene-land September yearling sale became the sale’s most significant statistic because it dropped to 26.7% from 27.5%. The improvement in trade over last year meant at least 30 more horses found new homes than would have otherwise had the buy-back rate stayed the same as in 2009. Keeneland deserves a lot of credit for shaking up the sale’s format. The first two select evening sessions were successful as was extending Book Two across four days, which produced a solid average price of $120,000. Sellers and their agents get most of the credit for stimulating trade, however, because they were realistic with their reserve prices. It’s a tough nut to swallow going into a sale knowing the value of your horse, based on stud fee, is really 35-40% less than what you actually paid. But sellers bit that bullet and horses changed hands. In 2009 the average RNA price was $52,628, and five of those buy-backs brought a final bid of $500,000 or more. Two horses were bought back for $900,000. This year the average RNA price was $48,447. There was a son of A.P. Indy that was bought back for $1.25 million on the second night, but the rest of the sale saw only one other RNA with a final bid above $500,000. By keeping the reserves reasonable, consignors were forcing buyers to raise their hands in the sales pavilion instead of hoping for a deal back in the barns. In the best of all possible worlds, every yearling offered at a Keeneland sale would find a buyer, race productively, then go to stud or to pampered retirement and a possible second career. But the real world doesn’t work that way, and some September yearlings are destined to become unwanted horses. The plight of unwanted Thoroughbreds has struck a chord in many segments of the industry, and racing states now have a variety of retirement and retraining programs, from large-scale to mom-and-pop. All of these programs struggle to find room for the sheer number of ex-racehorses, not to mention securing the funding to feed and care for them. It costs an estimated $2,300 a year to take care of a rescued horse, according to the Unwanted Horse Coalition, an equine industry alliance working to reduce the number of unwanted horses and improve their welfare. Slaughter is in the future of an estimated 7,000 former racehorses every year, despite the closure in 2007 of U.S. processing plants. These racehorses are among the estimated 90,000 or so that are now shipped annually to Canada and Mexico to meet their ends. 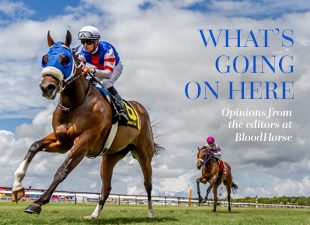 This week The Blood-Horse looks at the unwanted horse issue, how it’s being addressed, how other racing countries deal with ex-racehorses, and how some horses are saved while others disappear from the racing landscape. The pros and cons of slaughter are not debated, though Barbara Luna, program administrator for the Pennsylvania Thoroughbred Horsemen’s Association “Turning For Home” program, presents a strong argument for alternatives to slaughter. Dr. Tom Lenz, former chairman of the Unwanted Horse Coalition, notes that while the industry cannot eliminate unwanted horses, it can minimize the problem. The coalition and other groups deserve accolades for bringing the problem of unwanted horses to the forefront and for seeking solutions. Special Projects Editor Jacqueline Duke contributed to this column.